I provided the photographs and drawings for the following book. 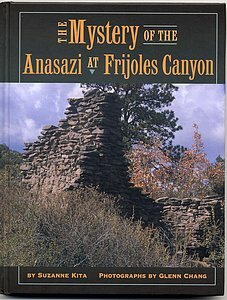 Frijoles Canyon, the location of world-renowned Bandelier National Monument, is in northern New Mexico. A thousand years ago, this canyon was settled by a people we now refer to as Anasazi or Ancestral Puebloans. Then, shortly before the Spanish came to the area, they disappered. We follow a family on a tour of Bandelier, led by a National Park guide. As the guide points out flora and fauna, discusses ancient customs and implements, and asks questions, we are drawn into the mystery of these ancient people. This hardcover book is available for $15, plus shipping. To order the book click on this link . This will take you to a gallery page with an order button.